The most important point of the Commons Agreement is that you agree not to upload anything that violates copyright or intellectual property laws. 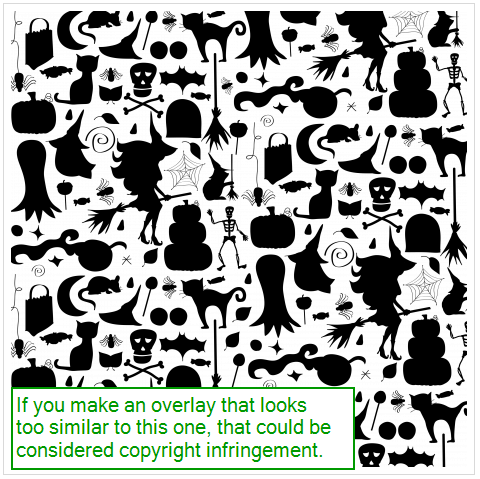 Generally this means that you must be the original creator of the designs you upload. Note: nothing below should be considered legal advice. You are responsible for researching and understanding copyright laws. Copyright law, and other intellectual property laws, mean that the original creator of something "owns" what they create, and what they create is protected from copying (without the original creator's consent). Copyright law applies automatically, which means that I don't need to "claim" copyright in order for my original creations to be protected. It is important to note that there are limitations to copyright law because of course people make things that are inspired by and sometimes similar to something that someone else has made (and at Pixel Scrapper we celebrate being inspired by each other! ), but generally the law means that you shouldn't copy other people's work too closely, or claim to be the creator of something you didn't create. Most copyright laws are protected by international treaties, so generally the laws apply to you no matter where you live. What does it mean to be the original creator of a design? In general, being the original creator of a design means what it sounds like: the design should be created by you, from scratch, without using anyone else's work. There are some exceptions (listed below), but generally this means you should not use or copy an existing graphic to help make your design (unless specifically allowed to do so, as in the case of Pixel Scrapper CU graphics). Copyright law generally means that you can't copy someone else's design exactly, or use someone else's design to make your own... but what about making your own design from scratch that is similar to someone else's design? Is that allowed? This is where the law gets fuzzy, because as we have already noted, of course people make things that are similar to what other people have already made, and most of the time that's fine. The rule of thumb for simple designs and ideas is that you can make things that are roughly similar to what someone else has made, but not exactly the same. 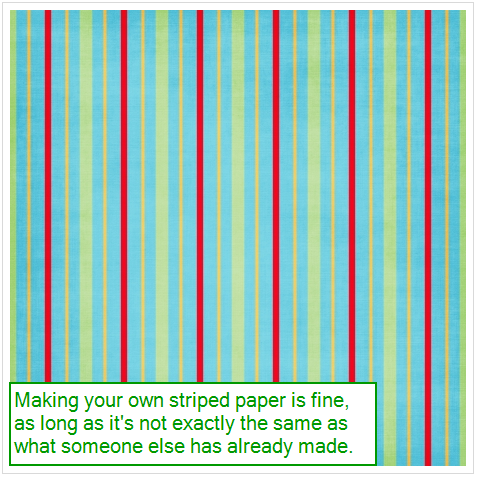 If I make a striped paper, you can also make a striped paper (as long as yours is slightly different). If I make an wood-grain alpha, you can also make a wood-grain alpha (as long as yours is slightly different). If I make a heart brad, you can also make a heart brad (as long as yours is slightly different). These ideas are too general to be copyrighted. I can't "own" the idea of striped paper or wood-grain alphas (If someone tries to tell you that you can't make your own wood-grain alpha because they made one first, they are wrong, and that's an example of "copyfraud"). In these cases, you are generally fine as long as you don't copy someone else's work exactly (for example, your wood-grain alpha should be a different shape and have a different texture than mine). When things get more elaborate, you have to be more careful, because if you copy an elaborate design too closely, that could be considered copyright infringement. The rule of thumb for elaborate designs is that if you make it from scratch you are probably fine (because you are not likely to make an elaborate design from scratch that is very similar to what someone else has already made)--but be careful of copying someone else's work. An exception to the rule of using other graphics to make your own designs is Pixel Scrapper's commercial use graphics. If you download Pixel Scrapper graphics for commercial use you can use those graphics to help you make your own designs (including designs that you upload to the Commons), because that is specifically allowed for in Pixel Scrapper's commercial use TOU, as you can see at https://www.pixelscrapper.com/tou. However, it's important to note that when using Pixel Scrapper CU graphics to make your own designs, you must modify or "remix" the original graphics. You cannot simply upload someone else's design and claim that you made it! Using one of our templates combined with your own work to create a unique design, paper, or embellishment. Combining our graphics to create your own creative designs (using a heart brad together with a ribbon template that you color to create a unique ribbon with a repeating heart pattern, for example). Taking a layered psd template, moving the layers around, recoloring some layers, flattening some layers, and adding some of your own layers to create something truly unique. Taking an existing graphic and applying a basic texture or color change does not generally qualify as a "remix." A special rule of the Commons: even though attribution is not normally required under the Pixel Scrapper CU license, graphics uploaded to Pixel Scrapper are required to have attribution links to other Pixel Scrapper graphics where appropriate (we provide a special field for this when uploading a design, so linking to graphics you used is easy). The issue with using CU resources from outside Pixel Scrapper is that most CU licenses have significant restrictions, and are not as flexible as Pixel Scrapper's: for example, they may allow you to use the resource to create things that you distribute to others under a PU license, but not things that you distribute under a CU license yourself (commonly called "CU4CU"). They may also have stringent attribution requirements, or only allow you to use the resources for printed (but not digital) distribution. Our recommendation? Stick with commercial use resources that have flexible and generous "CU4CU" licensing terms (like we have at Pixel Scrapper). Public domain graphics/photos are another exception to the rule. Public domain items are items whose copyright has expired (or items that were specially released as public domain). In the United States, copyright lasts for the life of the author, plus an additional 70 years. This means that you can scan one of Beatrix Potter's original Peter Rabbit illustrations and use it however your want to create your own designs (for example, to create a Petter Rabbit paper). But remember that anyone else can create a Peter Rabbit paper too! A large list of public domain resources, including photos, illustrations, and clip art, can be found on Wikipedia here. Note: Creative Commons 0 ("CC0") is a license that effectively places a creation into the public domain. CC0 items can generally be used as other public domain items, for any purpose, without asking permission. Note: The "Creative Commons" refers to a specific set of licenses, which are not related to the Pixel Scrapper Commons (even though the names sound similar). Most of the time at Pixel Scrapper when we refer to "The Commons" we are talking about the Pixel Scrapper Commons, not the Creative Commons licenses. Creative Commons items are things that people have created which are still under copyright, but which allow more flexibility in use than normal, because the original creators have chosen to release them under a Creative Commons license. Creative Commons items sometimes allow limited use and remixing, somewhat similar to Pixel Scrapper's CU license. For these reasons, we recommend not using Creative Commons graphics to help you create your own designs--at least, not designs that you upload to Pixel Scrapper. * Note: an exception to this rule is Creative Commons 0 ("CC0"), a license that effectively places a creation into the public domain. CC0 items can generally be used as other public domain items, for any purpose (see above). You may notice that designers sometimes incorporate scans or photographs into their work--for example, by using a scanned image of a leaf to create a paper or template. Using scans and photographs in your designs is fine, but you must be certain that the items you are scanning are not protected by copyright. Natural objects, like sticks, stones, and leaves. Very simple objects with extremely generic patterns (but see caution below). Objects which you are certain are more than 150 years old (and thus in the public domain). You should take extra care when scanning anything that is less than 150 years old. Textile prints and lace patterns are subject to copyright, though a lot of basic patterns are in the public domain (basic prints like stripes, many plaids, ginghams, and houndstooth checks). Scanning a very simple physical ribbon or button is probably fine--but your safest bet is sticking to old items, or natural objects. Remember: just because something is a physical object does not mean that it is automatically okay to scan it and use it in your designs. Remember: we all inspire each other! All this talk of copyright laws may sound a little scary and intimidating. Copyright laws are serious business and should be respected, but it's also important to keep perspective and remember that we are all inspired by each other, and build on each other's work in one way or another (and remember that no one can copyright an idea as simple as "striped paper"!). As Madeleine L'Engle says, "in a sense, nothing the artist produces is his in any exclusive way. An inventor takes inventory of that which is already there. A discoverer uncovers that which is." Creativity wants to breathe, and spread, and stretch its wings. We believe that inspiration is a gift to be shared. We believe that we do our best work together, and that a legacy is something for others to build on, not something to be fenced off and protected in a miserly way. That's why our licenses at Pixel Scrapper are as generous and freeing as we can make them, and why we strongly believe in focusing on the good parts of inspiration, rather than the bad. Respect copyright, but don't let fear of copyright laws prevent you from finding your own unique creative talent, and remember that others will be inspired by you, just as you are inspired by others!